Our Adult Community groups are a great way to fully engage and experience life at Johns Creek Baptist Church. CONNECT – Every Sunday morning at 9:45, our groups gather all over campus to connect and enjoy each other. Conversation, laughter and coffee abound! Additionally, our groups gather numerous times throughout the year simply for the fun of it. Deep and significant relationships are formed and fostered. FORM – Each Sunday, our Community Groups engage together in bible study and thoughtful reflection. The studies not only help form our identity as followers of Christ, but also shape the ways we “do life” – day in and day out. We are clay in the potter’s hands – being transformed from the inside out. MOBILIZE – Our Community Groups not only form relationships and grow with each other, but also engage in a wide variety of mobilization and missions projects throughout the year. We are not just hearers of the word…but doers as well. CARE – Each of us face hardships from time to time. Our Community Groups are active caregivers – coming up alongside those in the group who are hurting or in crisis. We take care of each other because we love each other. KIDS – While our Adult Community Groups are connecting, forming, and mobilizing on Sunday mornings – your kids are do-ing the same thing! Our Children and Students’ Ministries are dedicated to helping parents nurture the faith of their children. 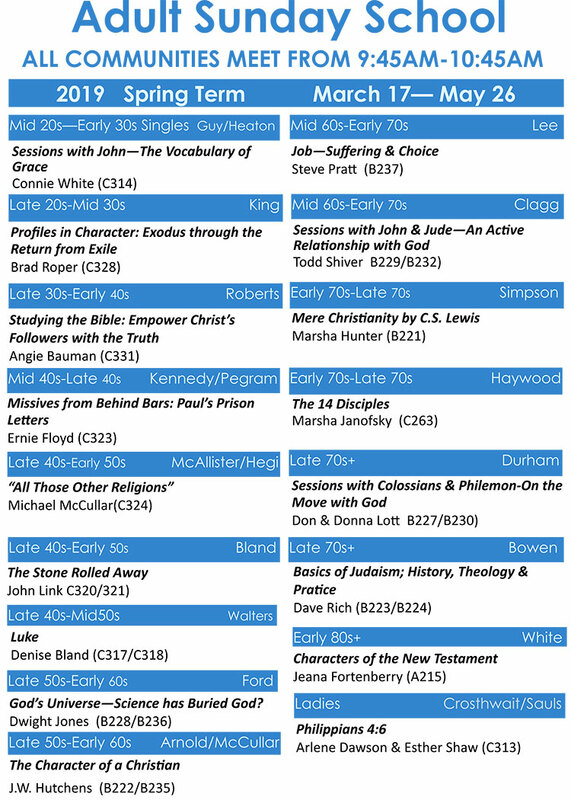 Johns Creek offers twenty-one Adult Sunday School Communities for learners of all ages. While we do offer unique communities for ladies and singles, the majority of our groups are co-ed and open to anyone. Groups are named based on the median age of the group. However, we always encourage newcomers to visit as many groups as they like and to join the one that best fits their needs. Our model for Adult Sunday School is unique in that our year is divided up into 5 terms. Each new term begins with a fellowship meal called Big Breakfast and lasts 8 to 10 weeks. While communities always stay together, new terms allow each group to hear a new teacher, which we call Seminar Leaders, and the opportunity to engage in the study of a new faith topic. Our current term offerings are listed below. We invite newcomers to join our groups at any time! For more information, contact our Formations Pastor, Michael McCullar, at 678-474-4404 or mmccullar@jcbc.org.